The University of Otago Information Science department has been working with Methodist Mission Southern to look at a totally new way of helping prisoners in the Otago Corrections Facility at Milburn to improve reading and writing skills. Otago's Department of Information Science has been at the forefront of investigating functional uses of both virtual and augmented reality over the last decade; the aim being to find meaningful ways for computing to solve real world problems. 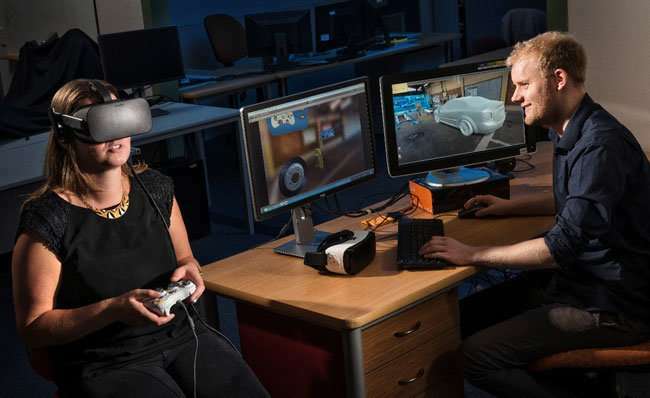 PhD student Jonny Collins then brought the need and the technology together into a prototype virtual reality application using a setting that is both familiar and motivating to the learner - a simulated car workshop. Jonny worked together with Mission Southern to integrate educational content, and local company Animated Research Limited provided assistance with the panoramic environment. Head of the University's Information Science Department Professor Holger Regenbrecht says it's already understood that people can learn another language through immersion, both in a real-world context and through using virtual reality technology. "This more interesting and relevant environment can help learning, and improved literacy skills for prisoners in this case improve rehabilitation and integration into the community," Professor Regenbrecht says. But the researchers are not only answering some of the technological questions, they're also doing it to meet a very real need that will benefit the community. "It is expected that there will be significant international interest in virtual reality contextualised learning. I believe this immersion technology has the potential to revolutionise learning," says Professor Regenbrecht. At the same time this gives the University a positive way of connecting to business and the community.